This Labor Day, women, men and children gathered in over 100 cities in the U.S. to support evidenced based maternity care as part of Improving Birth: National Rally for Change. In Jacksonville, Florida, we stood in front of Memorial Hospital (whose c-section rate is 44%) in like-minded & hearted togetherness. Each has their own story, their own reason for being there, but we all agree on one thing: we want CHANGE. It’s not about imposing one way for every mother to give birth. 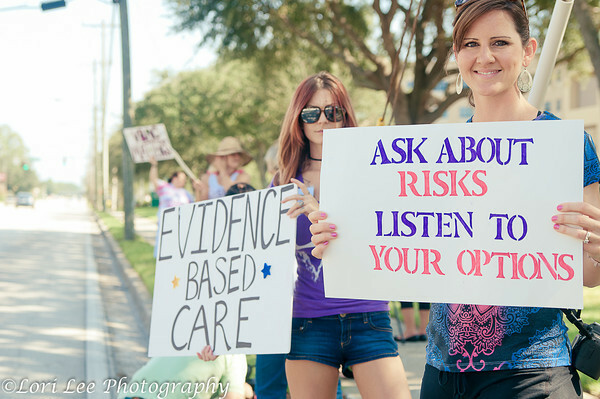 We stood together to raise awareness that there are options beyond epidural or no epidural, to bring to light that women must educate themselves on birth interventions and options. So many medical procedures have become routine (used without being indicated) and we have moved further and further away from nature. Evidence does not support induction with no medical necessity, automatic repeat cesarean, continuous fetal monitoring, restricted movement and IV fluids, yet these are all commonplace. This overuse of intervention is like throwing a wrench into the system and it is not without consequence. We want pregnant mothers to know that they can trust birth and that a gentle, evidence-based birth has potential to shape the relationship to their bodies and protect the optimal growth of their newborn. And it can be a source of life-altering empowerment. This is the change we want to see. Powerful women accessing their birth wisdom to participate fully in all decisions and actions in relation to their pregnancy and birth. It felt so good to take to the streets with women across the country, knowing that we are a part of something bigger than any one of us could do alone. I sat in awe after the first prayer & meditation that we have the tools to connect globally for the good of humanity. If you are a birth professional, you can register up until September 9th for the Sacred Birth Be-In (click on the link above), and check out all the events for Empowered Birth Awareness Week, including BOLD’s Virtual Town Hall. Thank you for your strong stance on this important issue. In the ‘olden’ days a lot of my sisters in community had more choices. Natural childbirth Lamaze classes were plentiful. La Leche League offered support for those mothers who wanted to nurse. My OB (men) were supportive of natural childbirth, too. Re-visit and reclaim what is natural. Let mother and baby go with nature’s rhythms. Thank you Donna! It makes such a difference to feel supported in our decisions. Thankfully, La Leche League and Lamaze are still supporting women in natural birthing and breastfeeding. I love what you said- Let mother and baby go with nature’s rhythms. Thanks for this, Carrie! It was nicely written. I hope we are making a difference, making our mark on the world, and getting people to think twice. Thanks for commenting Elizabeth. We are making a difference in small & big ways! Nice post Carrie, and thank you for your commitment to optimal MotherBaby evidence-based care. Post your sign now!!! Rae, it was great to get to talk with you at the rally! Thanks for educating me on MotherBaby and for EVERYTHING you do for MotherBaby!! I love the photos! I think it is great that you are part of a group of women looking into the research and studying the science behind what is best for our bodies! (and our babies!) And sharing it to change the system and birthing culture. Thank you Jen! The science backs up what women have always known (in our bodies). Raising awareness on evidence based care will hopefully get women questioning and doing their own research.